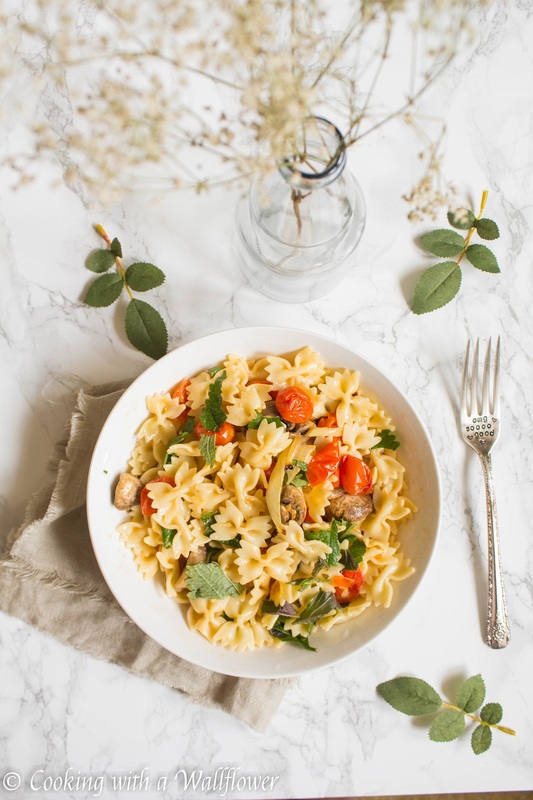 Bow tie pasta tossed with roasted mushrooms, tomatoes, onions and fresh herbs then lightly seasoned with a balsamic vinaigrette. 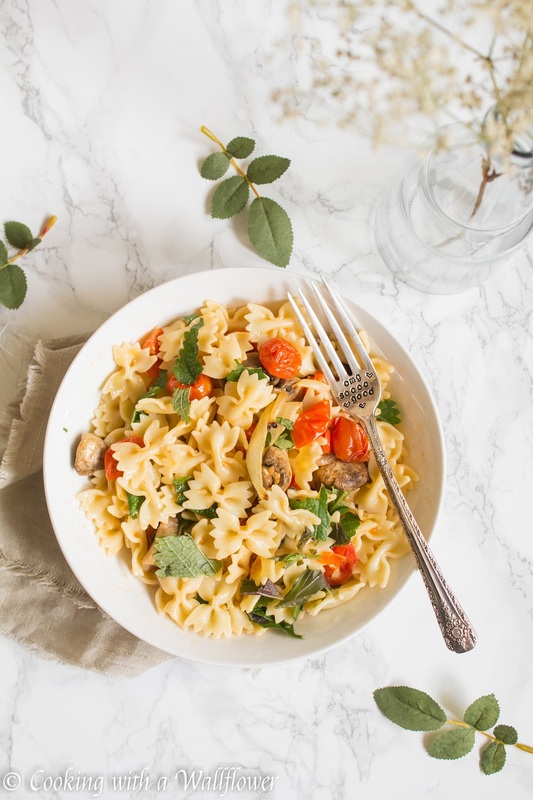 This roasted mushroom pasta with fresh herbs is delicious and easy to make, perfect for a weeknight dinner. Just one more month until I leave for vacation. I’m so excited! Has anyone been to Ensenada in Baja California before? I’d love any tips or recommendations you might have, especially since it’s a cruise and I’m only there for a day. And in less than four months, I’m headed to Denver, and for the first time ever, I’ll be stepping beyond the airport. Any recommendations there will also be appreciated! And cooking? Ha! Almost nonexistent. So it’s kind of nice to have easy to make recipes on hand. Especially when it can double as dinner and lunch to bring to work the next day. And this pasta is definitely perfect for both. 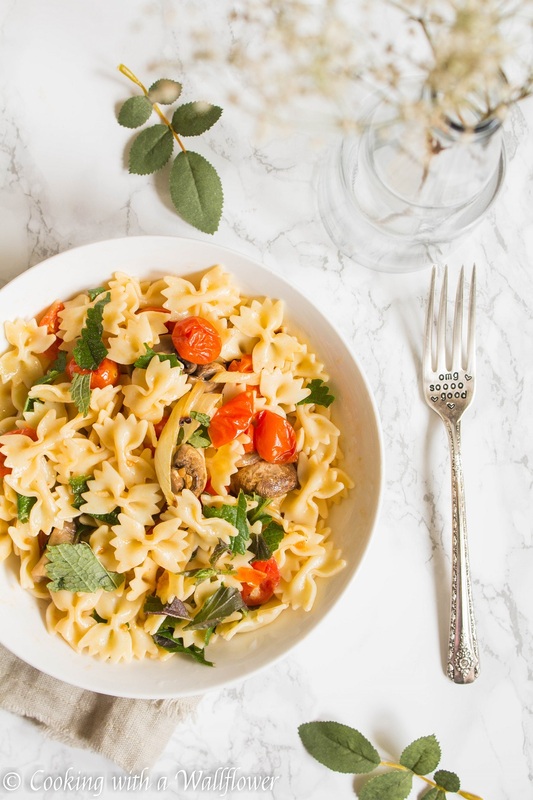 What I love most about this roasted mushroom pasta with fresh herbs is that it’s filled with simple ingredients. You can easily find these ingredients in your fridge and pantry, or you can easily substitute ingredients to your taste. For this pasta dish, just place mushrooms, tomatoes, and onions in the oven to roast until they’re slightly charred and have softened. Make the pasta, toss with the roasted veggies, olive oil, balsamic vinegar, and fresh herbs. And you’re all set! 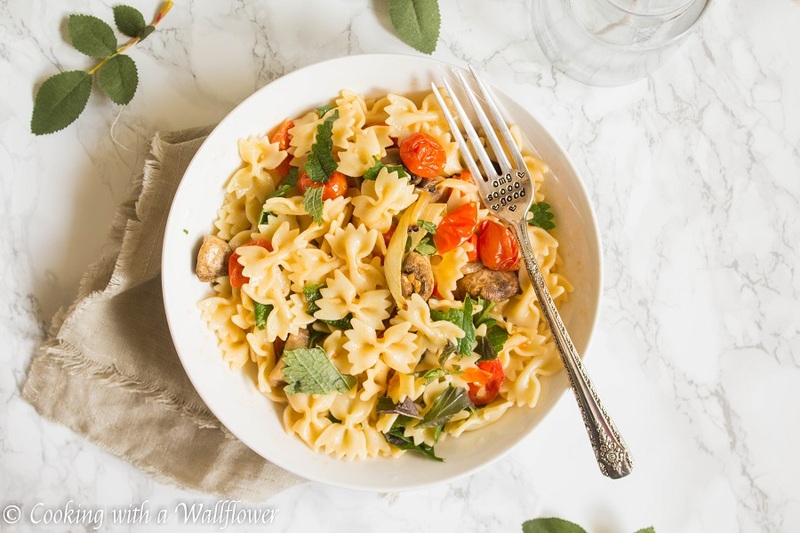 You can find this Roasted Mushroom Pasta with Fresh Herbs recipe over at Ask Anna where I contribute monthly. This entry was posted in Entree, Farmer's Market, Healthy, Italian Inspired, Pasta, Quick and Easy, Recipes, Vegan, Vegetarian and tagged farmer's market, Pasta, quick and easy, vegan, vegetarian, weeknight dinner. Thanks for visiting my blog! This recipe looks awesome, might have to try it with some gluten-free pasta! Hope you’ll like it, Kirsten! This looks delicious! And that fork is just so pretty! Yum. I love bowtie pasta. Feel better! Hope you are feeling much better quickly. When you are in Denver check out Snooze, the best breakfast place I’ve had the delight of going to. The seasonal veggie benedict is to die for :). They have so many amazing breweries and mexican restaurants to check out too. I feel the same way when I am sick, it takes forever to feel better. Try a detox bath with 1 cup of epsom salts, 1 tablespoon ginger, and 1 tablespoon baking soda. Get the water as hot as you can handle. I did this two nights in a row the last time I was sick and I felt almost completely better by the third day – hope this helps! Thank you so much for all the tips! I’ll have to bookmark Snooze! I love breakfast/brunch! This looks delicious!! I love pasta and mushrooms, so this will definitely be a hit! Hope you feel better soon. This looks like a great dish, thanks for the post! I shall try that this evening. Thanks.